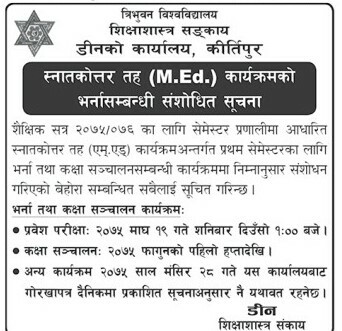 Tribhuvan University, Faculty of Education has publishes notice regading amendment of entrance exam date for admission in Master of Education (M.Ed) Semester System for the academic year (2075/76). 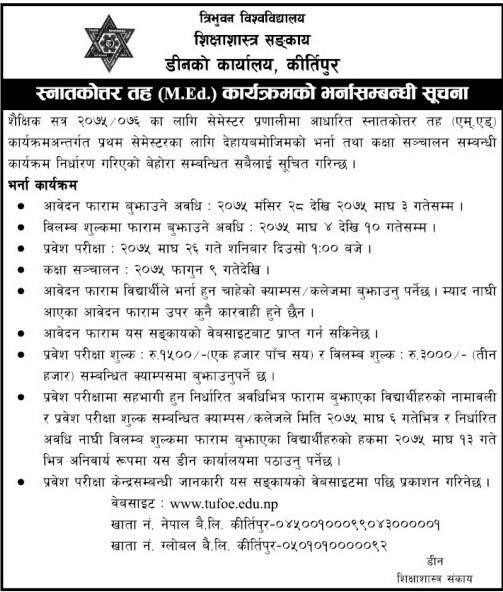 Tribhuvan University, Faculty of Education announces admission open for Master of Education (M.Ed) First Semester for the academic year 2075/76 BS. The application form distributions starts from Mangsir 28, 2075 onwards. The entrance examination will be held on Magh 26, 2075.